This cannot possibly be true! In an almost unbelievable turn of events, the Lib Dem offices on the Leavesden Road, North Watford, were coned off, as if to "prevent evidence from being destroyed". 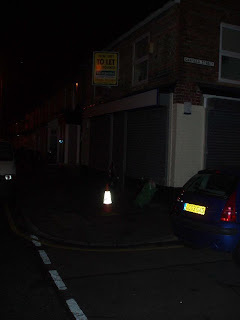 The shutters were down, there was not a single orange Lib Dem sign on display and an estate agent's "To Let" sign was firmly affixed to the front of the building. Liberal Democrat Portfolio Holders, have been refusing all calls and e-mails, and even Cllr Iain Sharpe's blog has been left abandoned for several days. Lobster Blogster had hoped to bring you news of who the "third man" is, the political leader with responsibility for Housing during the period 2005 to 2006, but now it seems we may never know. It looks as though the building was cleared out several days ago. Rubbish has already started to accumulate. An elderly man with white hair was seen leaving the building with bundles of paperwork on Saturday. Is this when the Lib Dems upped sticks and went? There are signs that a lot of alcohol had been consumed, and a vacuum cleaner has been left by the front door. Up the street an old settee is left right across the pavement. Could this be the same sofa where leading Lib Dems sat down in comfort, whilst collecting huge allowances from the Watford tax payer? UPDATE: Oh no, it looks like we've found out who the new tenants are! The Watford Observer reported today that the Gold Plated Traffic Cones saga is almost over. Drivers in the area face only a few more months of driving misery, before a team of specialised "traffic cone removal operatives" are assigned to the dangerous task of re-opening the full width of the road. Claire Ward MP, said this was a "victory for common sense" after being told that the M25 was likely to be further widened in approximately two years time. Full story here. Everyone in my office has been following these extra-ordinary comings and goings all day. I popped into the One Stop Shop but they couldn't help name the third man because their computers have been broken since Thursday. Wonderful service though. Very thoughtful and helpful even though their work is much harder without computers.